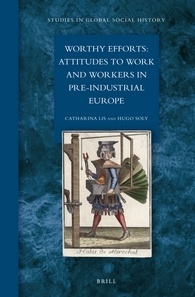 In their magnum opus Worthy Efforts: Attitudes to Work and Workers in Pre-Industrial Europe Catharina Lis and Hugo Soly offer an innovative approach to the history of perceptions and representations of work in Europe throughout Classical Antiquity and the medieval and early modern periods. Covering the broadest possible range of historical writings to elucidate the subject, and using visual representations as sources of information as well, they address the significance of work for different groups and its impact on their sense of self-esteem and their social identity. 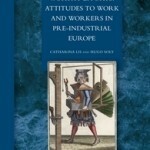 The authors reject the standard historical account of perceptions of work. They question the clear distinction generally drawn between Classical Antiquity and subsequent periods, the revolutionary role attributed to Christianity, and the part played by monasticism, Humanism, the Reformation, and the Enlightenment. Studies in Global Social History, vol. 10, Brill, 2012, XIV+664 p. Hardback, € 139,00. ISSN: 1874-6705 ISBN13: 9789004231436. Hugo Soly (1945) is Emeritus Professor of History at the Vrije Universiteit Brussel, and currently Guest Professor at the University of Antwerp. He has authored and co-authored many books and articles on the social history of pre-industial Europe. Catharina Lis (1945) is Emeritus Professor of History at the Vrije Universiteit Brussel, and currently Guest Professor at the University of Antwerp. She has authored and co-authored many books, and has recently co-edited The Idea of Work (Ashgate, 2009).